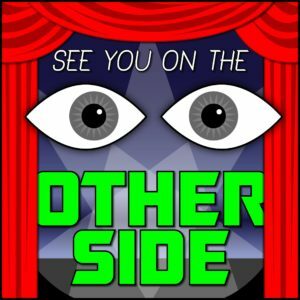 Here’s an episode chock full of paranormal goodness. First, I tell Wendy and Allison about the time that I worked for Miss Cleo (because sadly, the actress who portrayed her, Youree Dell Harris, passed away last week.) Second, Allison and I were recording on location from [Milwaukee’s haunted Hilton Garden Inn](hilton garden inn milwaukee haunted). We decided to make it a paranormal siblings’ adventure day and not only stayed at the haunted hotel, but also did our first float in a sensory deprivation tank. at without any stimulus, it would just fall asleep. These tanks were designed to test that theory. 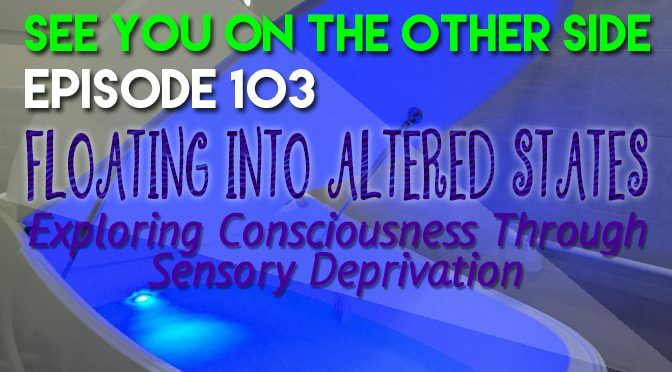 Sensory deprivation tanks were featured in Fringe where in the first episode, FBI Agent Olivia Dunham goes in the tank with a wide variety of hallucinogens to try and speak with the mind of her deceased partner and lover. Dr. Walter Bishop, the mad scientist featured on Fringe would often go in the tank under the influence of LSD as well. In the recent Netflix show, Stranger Things, a tank is featured as a way to facilitate psychic communication. When are the jets supposed to turn on? 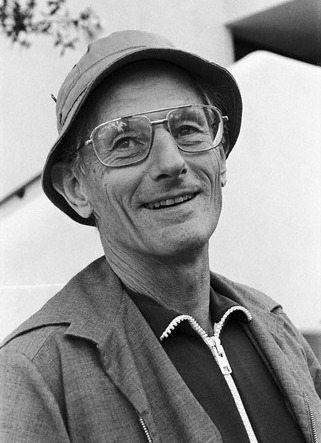 The scene in which the scientist becomes cosmic energy and his wife grabs him and brings him back to human form is straight out of my Dyadic Cyclone (1976)…As for the scientist’s regression into an ape-like being, the late Dr. Craig Enright, who started me on K (ketamine) while taking a trip with me here by the isolation tank, suddenly “became” a chimp, jumping up and down and hollering for twenty-five minutes. Watching him, I was frightened. I asked him later, “Where the hell were you?” He said, “I became a pre-hominid, and I was in a tree. A leopard was trying to get me. So I was trying to scare him away.” The manuscript of The Scientist (1978) was in the hands of Bantam, the publishers. The head of Bantam called and said, “Paddy Chayefsky would like to read your manuscript. Will you give him your permission?” I said, “Only if he calls me and asks permission.” He didn’t call. But he probably read the manuscript. 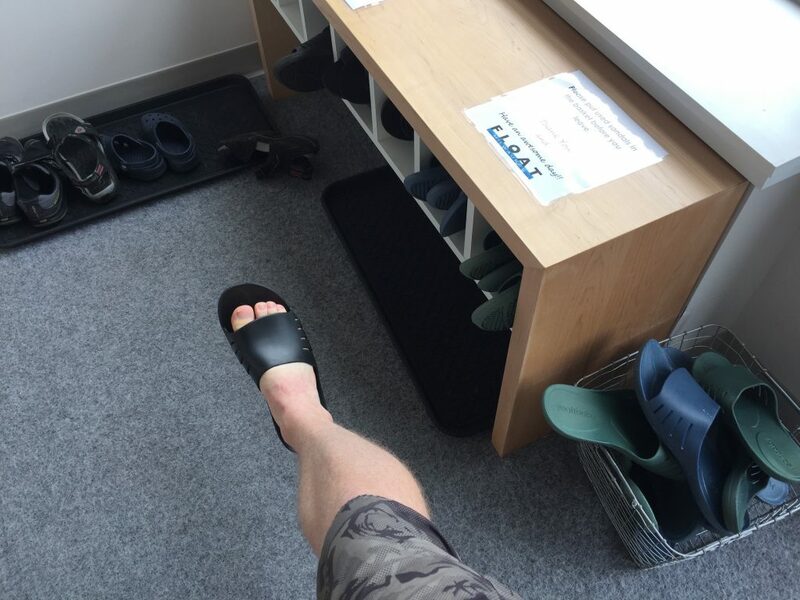 So, once you walk in the door, you take off your street shoes and put on shower shoes, which I haven’t seen anyone use since I was in the college dormitory. So, different shoes, it’s like bowling! Then you sign in at the front desk. 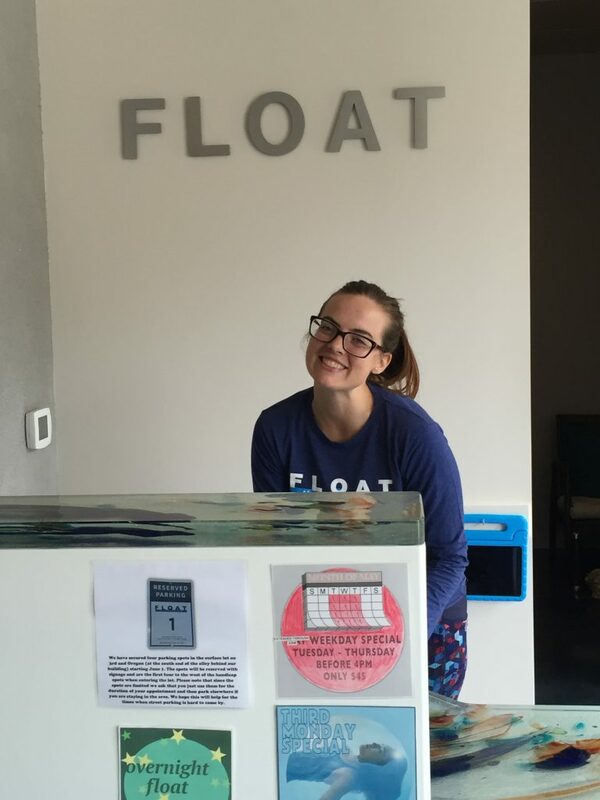 This was Allison, who has been at Float Milwaukee since it opened and she spent time explaining the floating process to us and endured our litany of questions about what to expect, experiences that she’s had, and if anyone there has had paranormal encounters while in the floatation tank. She also asks you to sign the legal waiver in case anything does happen in the floatation tank. Anytime things involve laying around in water, I suppose there’s going to be some liability issues. From there you go into the back where everyone gets their own little room with a floatation tank. This part feels more like a doctor’s office than some New Age-y hippity dippity thing. And here it is, the sensory deprivation tank with its science fiction-y blue light. It looks like a big Pac Man that’s coming to eat you! So, I wore a swimsuit and a beach outfit, but nope, this is a full naked experience – like a tanning bed without the cancer! You take a quick shower before you get in. A calm female voice tells you when it’s time to get in. And that’s it, then you’re in the tank. And you float very easily, your whole back of your head does dunk in and so your ears will be underwater, so get ready for that feeling. But other than that, it feels nice and easy. There’s enough space above your head so you don’t feel claustrophobic, it’s not like a coffin. You can choose to keep the light on and some meditative music playing if you want or you can keep it totally dark and silent with nothing but the beating of your heart. I kept the light on for a little while because I liked feeling like I was in the future, but eventually I went to total darkness and silence. And then you relax or you think or you meditate or you heal, basically you do whatever you want in your head. 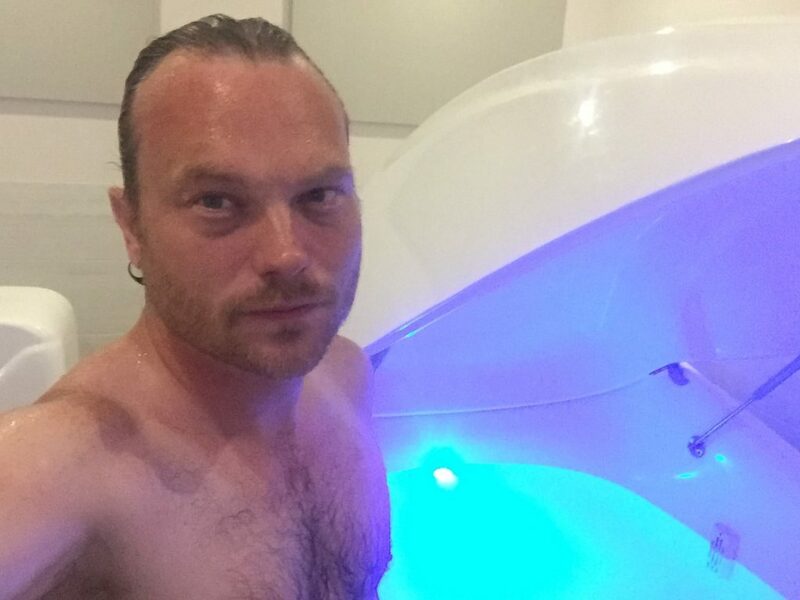 It’s forced relaxation for an hour with no interruptions, no mobile notifications, no anything… it’s called sensory deprivation for a reason because you’re eliminating all external stimuli and it’s wonderful. We did a little telepathy experiment where my brother-in-law tried to send a one-word message that my sister and I tried to receive, so I was paying attention to the words that popped into my head as well. After the hour is up, you hear the same calm female voice letting you know it’s time to get out. 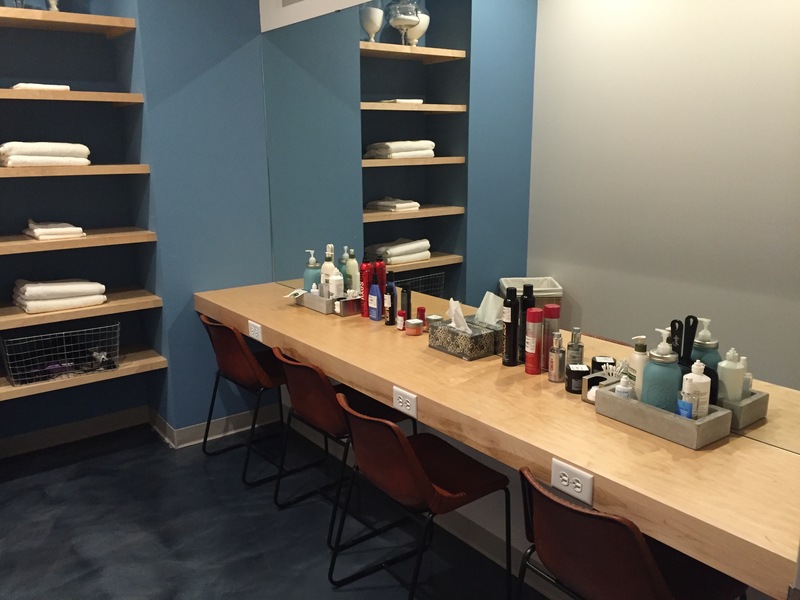 You jump in the shower again to wash the salt off and can head to the post-float dressing room to dry and style your hair and reapply your makeup. After that, it’s a trip(!) 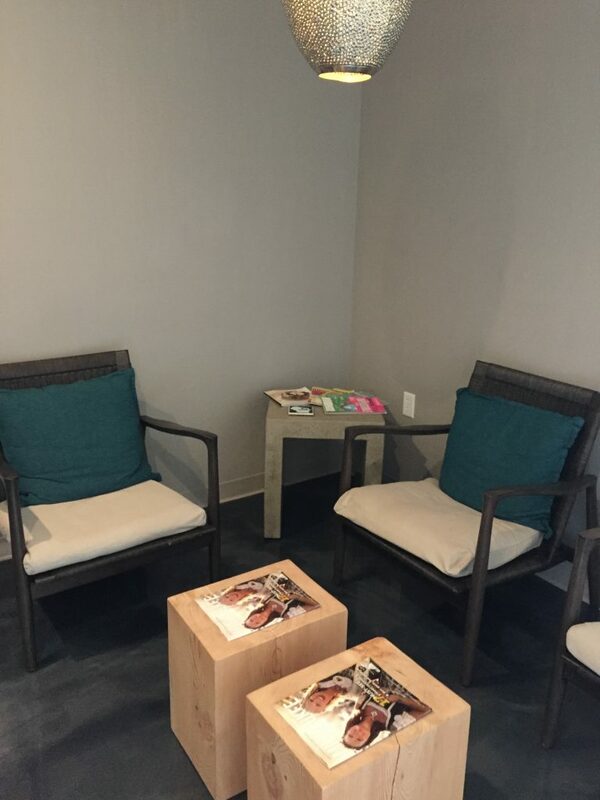 to the decompression room where they have some nice teas (the Equilibrium was my personal favorite) and you can journal about your experience as well as see what others have had to say about theirs. And here I am in the post-float afterglow enjoying that Equilibrium tea. While I didn’t get the one-word psychic message right nor did I experience any hallucinogenic effects or devolution, it was a wonderful meditative and relaxing experience. 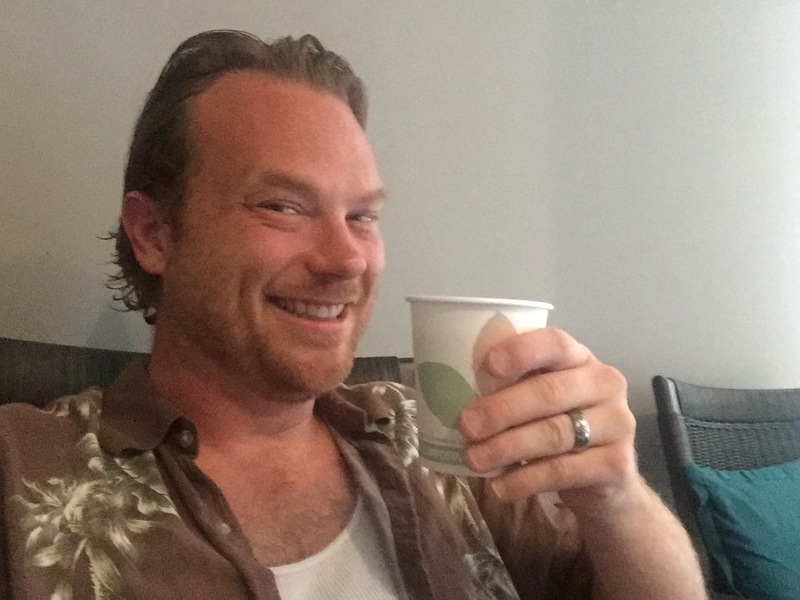 That’s my fake smile when I’m wishing there was alcohol in my cup! Overall, floating was pretty awesome and I wouldn’t hesitate to do it again. 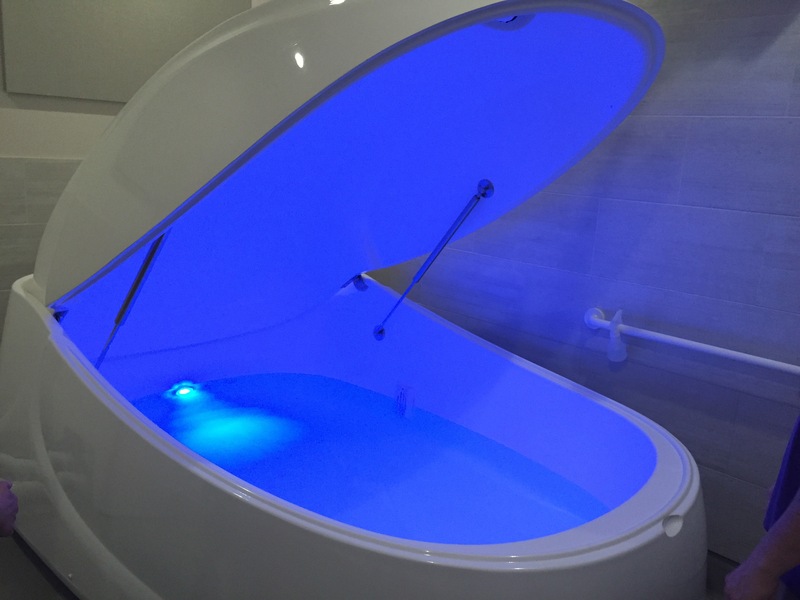 They even have overnight floats in case you want to spend a nice long time exploring your consciousness. 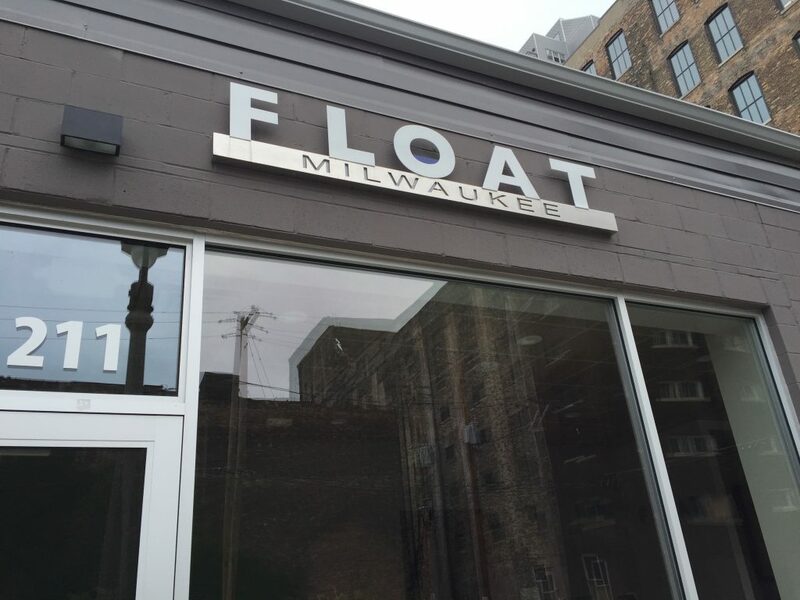 We don’t get any referrals or kickback from Float Milwaukee, but I would very much recommend them . 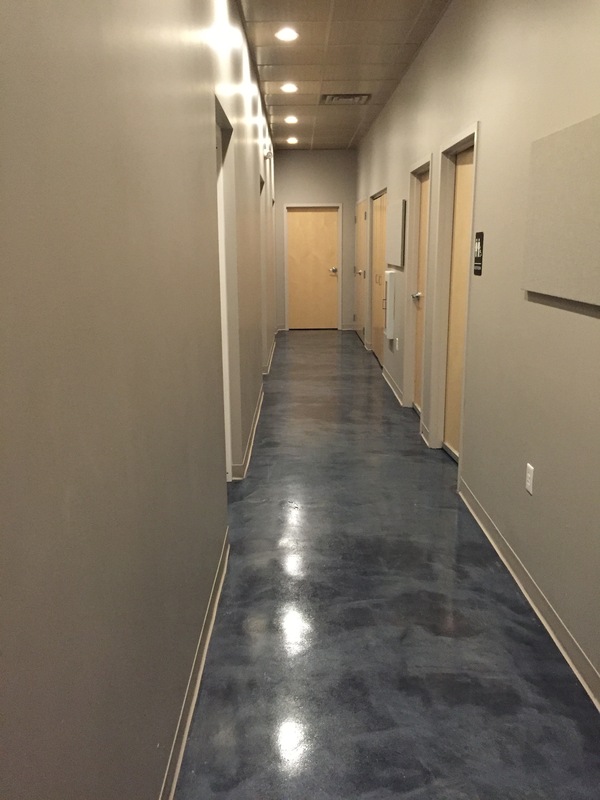 The staff (Glenn and Allison) were friendly and knowledgeable and the whole place was very clean and safe. 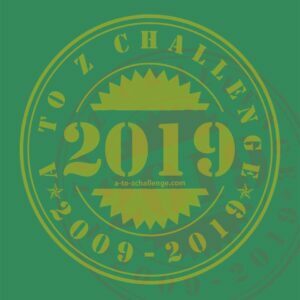 For the Sunspot song this week, we picked the first song of our very first album, Radio Free Earth. Part of the fun of floating is the feeling of weightlessness. Too many things in our lives weigh us down, we build up too much and let go too little. That’s what this song is about, here is “Artificial Gravity”. Because I think that it’s time for me to go. And I think that it’s time for me to go. I was living in a hologram of only you and me. Like the way I feel you are. I know I have to go but don’t forget me when I’m gone. One thousand miles into the night, you’ll be the brightest star in my sky. but I think that it’s time for me to go. so I can make it through the night. 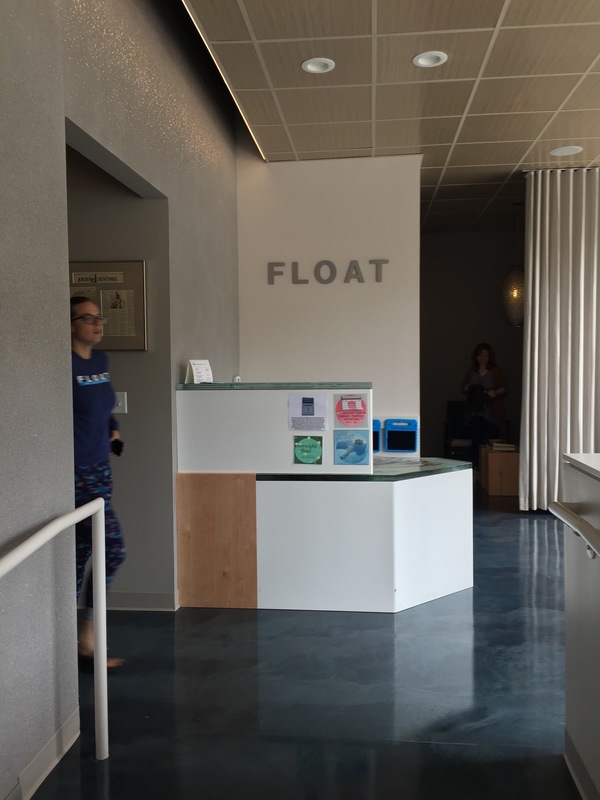 one of my friend recently went to Easy Float for sensory deprivation tank and he share his experience in concern with stress and anxiety.